There is nothing that quite captures the imagination the way that the glow of gold can. Its grandeur and glint elevates any tablescape to stunning elegance, and combines the grace of classic style and the exhilaration of a modern statement piece. This week, FIneline Settings want to take time to highlight our most popular and highly demanded gold-garnished pieces, our Splendor and Gold Secrets Collection! 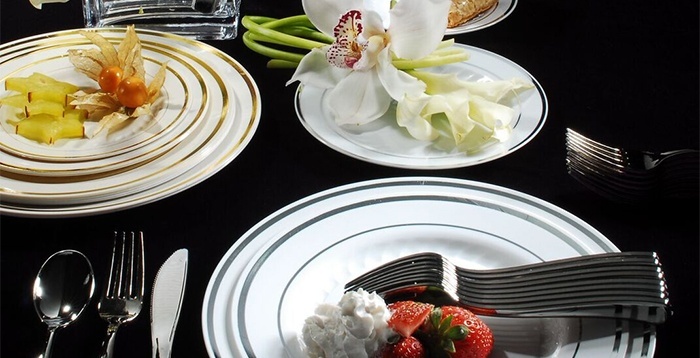 Our round, gold-rimmed plates have been a tried and true standard in the disposable dinnerware industry. 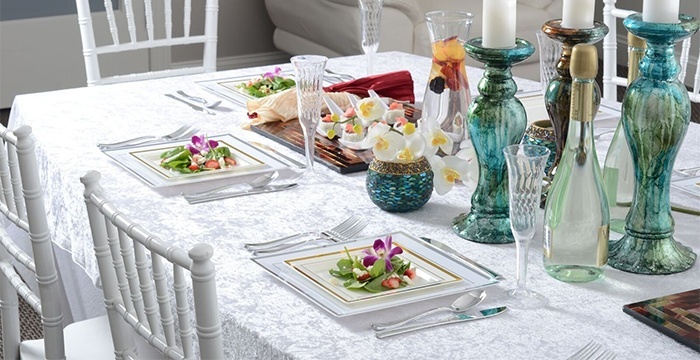 No matter the event or theme, our Gold-foil plates can both compliment and define a table setting! With their refined and subtle details along the circumference, the foil finish adds to both that distinct and classic style that will illuminate your table design, and with multiple sizes to choose from, continuity is assured. When we introduced our Square Splendor in 2015, elegance now had an edge. With its sharp lines and modern design, it can now add a glint of classic elegance to the modern table, with the subtle addition of our gold-foil rim. With three sizes to choose from, our square plates can carry you from cocktail hour to dinner course in seamless style. Due to their distinctive but complimentary golden trim, this collection of dinnerware will accent any event motif at any time of the year! Last, but certainly not least, we highlight what is, perhaps, our most sought-after addition to our product line in recent years. We’re speaking, of course, about Golden Secrets! 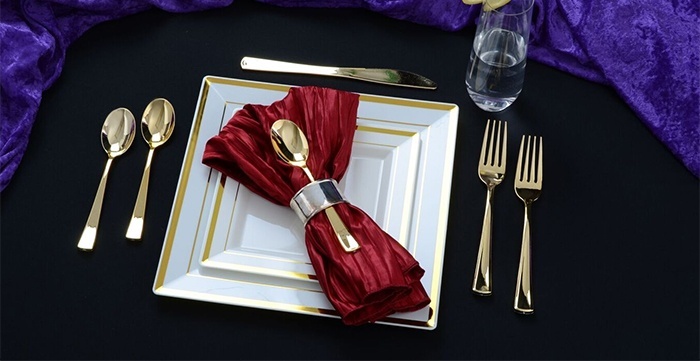 Regardless of whether you prefer square or round, our Gold-finished disposable cutlery will be the perfect companion to your gilded place settings! Our gold cutlery's highly reflective and vibrant finish has the look and feel of real flatware; and not only is it beautiful, but it is durable to the last cut, scoop and prong. For a helpful review, take a look at some of the key features of our gilded products that have helped establish them as the new standard in disposables gold! We hope you found this information helpful when planning your next gilded event, and our fantastic Sales Represensatives and Customer Service team are always happy to assist you with any further inquiries you might have! Happy 2016 & Have A Great Week!